This tutorial provides you with a foundation for working with Adobe Dreamweaver image editing. It is the first lesson in the Adobe Dreamweaver CS6 Digital Classroom book. For more Adobe Dreamweaver training options, visit AGI’s Dreamweaver Classes. 1 Click on the eggplants.jpg image in products.html to select it, then click on the Brightness and Contrast button in the Property Inspector. A warning dialog box appears, indicating that you are about to make permanent changes to the selected image. Press OK.
4 Click the Preview checkbox in the lower-right corner to see the original photo. Click the Preview checkbox again to see the changes. Press OK.
1 In the Files panel, click on the belgianchocolate.jpg file to select it. From the Files panel menu ( ), select Edit > Duplicate. A new file named belgianchocolate - Copy.jpg appears in the list of files inside the images folder. 2 Click on the belgianchocolate.jpg image in the document window to make sure it is selected, then click the Edit Image Settings button ( ) in the Property Inspector at the bottom of your page. The Image Optimization window appears. This window allows you to either choose from a number of compression presets, or to create your own. Currently, the format is set to JPEG because Dreamweaver recognizes the type of file you have selected. Notice in the bottom-left corner that the file size is listed; in this case, 31k. Pay attention to this number as it plays a role in the rest of this exercise. The Image Optimization window appears when you click on the Edit Image Settings button. 3 Click the preset menu and choose GIF for Background Images. The optimization settings appear. Click the Color menu and choose 4. The image of the chocolate changes to a preview of these settings, and the image has become flat with most of the detail removed. Notice that the file size has changed to 3K. 4 Click the Format menu and choose JPEG from the list. You now have a slider for quality, the default value is 80 and you can see the file size has changed to 9K. Drag the slider to the left to a quality of 10 and notice that the image quality changes instantly. Again, this is too drastic a trade-off. Drag the quality slider to 90. The image looks slightly better than it did at a quality of 80, and you have a file size of around 14K (which is approximately 50% of the original image). 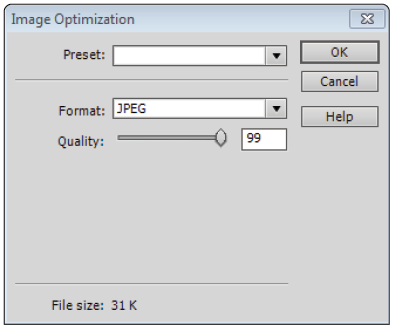 5 You can also choose to do your optimization in Photoshop. Click the cucumbers image, and then in the Property Inspector, click the Photoshop icon if available. Note that you must have Photoshop installed for this icon to be visible. As noted earlier, you can always change the photo editor that Dreamweaver uses by opening Edit > Preferences > File Types/Editors (PC) or Dreamweaver > Preferences > File Types/Editors (Mac), and then changing the application associated with images. Click on the Photoshop icon to launch Photoshop. 6 The image will open in Photoshop, and then you can make any changes you want, as well as use the more in-depth controls of the Save for Web feature. We will not walk through that process now, so you can close this image and return to Dreamweaver. Assuming you have a backup copy of an image, it is possible to swap one image for another. To swap out the image, you’ll simply change the Src attribute, using the Property Inspector. But first, it’s a good idea to rename the duplicate image. 1 Right-click (Windows) or Ctrl+click (Mac OS) on the file named belgianchocolate - Copy.jpg in the Files panel and choose File > Rename. Type belgianchocolate_original.jpg and press Enter (Windows) or Return (Mac OS). 2 Click on the chocolate image in the Design view to select it. In the Property Inspector at the bottom of your page, highlight the text that reads images/belgianchocolate.jpg in the Src text field.